My wife and I enjoy visiting America’s national parks and going for short hikes. I am a bit impulsive on the trails and am ready to start walking at almost any trailhead. My wife is more methodical. She wants to know if the trail is a loop, how long the hike will take, and whether we have enough water to sustain us for the duration of the hike. As I get older, I realize the wisdom in her words, and now I plan carefully for such adventures to insure that I do not put myself at risk. I thought of my own hiking experiences in the Canyonlands in Utah as I watched 127 Hours, the true story of Aron Ralston, an extreme sportsman who finds himself trapped in an isolated canyon in Utah after a boulder falls on his arm. The story begins on Friday, April 25, 2003, when Aron is preparing for a day of hiking in Utah’s Canyonlands National Park. Excited about his upcoming adventure, he is careless about his preparation. A clever camera shot of his hand trying to find stuff in a closet reveals that he forgets to take his trusty Swiss knife with him, a fact that will have consequences later on. Once into his hike, Aron climbs over and through narrow stone passageways, and then tragedy strikes. He dislodges a large boulder, which crushes his right arm against the canyon wall. He calls for help, but no one can hear him. He is in a remote section of the park with no one nearby. Moreover, he has told no one where he was going that day, and his situation soon turns desperate. Realizing that his fate is in his hands only, he begins a video diary with his portable camera and starts to ration his water and food. As his strength ebbs away, he understands that the sole way to survive is to amputate his arm, a near impossible task with a dull-bladed knife on a multi-tool device. With each passing hour, Aron gets groggier, and thinks about his friends, his family and his uncertain future. Finally, he accepts the reality of his situation and methodically plans to amputate his arm with the crude devices he has available. It is both wrenching and riveting to watch his ordeal. The ordeal changes Aron. Instead of being the independent adventurer responsible only for himself, he now understands that he needs others. His tortured cry for help at the end of his trial is a recognition that living for oneself is ultimately a lonely existence. On another level, Aron’s ordeal reminds us of the importance of properly preparing for a dangerous trip, letting people know of your whereabouts, and evaluating the inherent risk before attempting a perilous task. Furthermore, it reminds us to think about the definition of an acceptable risk when it comes to engaging in problematic behavior which may lead to loss of life. Jewish law is prescriptive regarding the notion of acceptable risk. The Bible says “you shall guard your souls,” which means that we should not do anything that jeopardizes our health and safety. The Talmud even instructs us not to walk next to an unstable or shaky wall. Furthermore, if we build a house, we have to insure that it is safe. If it has a roof that people can traverse, the roof must have a fence. If we own a dog that bites people, we have to make sure that the dogs are in a secure location so that guests to our home are free of danger. Recent codes of Jewish law forbid smoking under the same guideline. Smoking is hazardous to your health and, therefore, is considered an unacceptable risk. 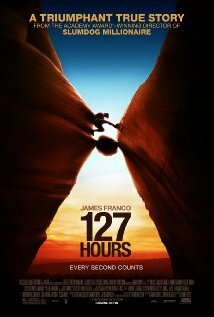 127 Hours is a gripping narrative of survival. Embedded within the story are many life lessons. It encourages us to celebrate and enjoy life, to value the presence of significant others in our lives, and not to be careless and place ourselves in unnecessary danger.